We are always very busy at BioSweep UK Ltd providing our services all over the country and this week we are in South East London treating a mould issue! 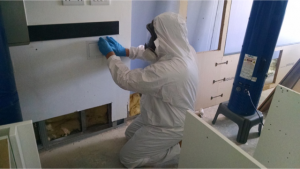 Our technicians are currently treating ten apartments in South East London which have developed significant mould issues after an escape of water. BioSweep UK Ltd conducted air sampling tests within the apartments and upon receiving the results, we discovered that the tests had returned the highest result of mould spores on any air sampling test we had ever conducted. The surface samples were also extremely high! We are now treating all the surfaces within the apartments with our unique Serum 1000 technology, which breaks up the surface tension of the mould so that they can then be vacuumed up, as well as wiping down all the contents within the apartments. Following this, BioSweep UK Ltd will be conducting our BS900 air and surface decontamination treatment to ensure that all contaminants are removed from the apartments. So that we know the treatment has been successful, we will conduct further air and surface sampling tests in every single apartment to ensure that they are now at an acceptable level. All of this will be completed in just three periods of two days each. To find out how BioSweep UK Ltd can help you with a mould issue, please give us a call on 01243 697359 today! Photo below of our technician Rory undertaking the mould treatment!